A stout annual herb, glabrous (without hairs or scales) or sparsely hairy with non-glandular hairs growing to about 1.5m high. It grows in waste grounds and disturbed agricultural areas. It is often found growing along roadsides, river flats and near stockyards. It prefers warm, temperate and subtropical regions. 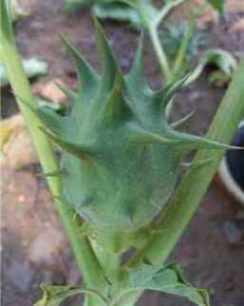 It is a poisonous weed and it competes strongly with summer crops in many areas of the world. The branches are repeatedly forked and green or purplish towards the base. The whole plant is moderately hairy except for the more mature parts, on which the hairs may be sparse or absent. The mature leaves range from broadly ovate and mildly angular to rounded-triangular mostly 8-14cm long and 6-16cm wide with a few shallow usually toothed or sinuate (with a deeply wavy margin) lobes. The leaves are alternate and are on long slender stalks. The leaves have an unpleasant odour when crushed. The flowers are white and are borne singly on short stalks in the forks of the branches. They are trumpet shaped when fully open. The corolla is 4-6cm long, consists of five connate (joined) petals that end in a slender point 1-2mm long. Stamens are not exserted (stamens are not protruding beyond the sepals or petals), and the stigma is below the anthers. The calyx is usually 3.5cm long with the lobes being 4-7mm long. The capsule body is ellipsoid and is 2-4cm long and 2-3cm in diameter. There are usually 40-60 spines that are stout, conical, sharp and usually longer towards the apex of the capsule. They are generally 10-15mm long, with the longest being at least half the length of the capsule. The seeds are 4-5mm long and are either black or grey. It flowers in summer-autumn. It is a serious weed of summer grain crops in Queensland and New South Wales. It is glabrous or sparsely pubescent (a somewhat dense covering of short, weak, soft hairs) with non-glandular hairs. The flowers are white and 4.5-6cm long with the capsule having 40-60 stout spines with the spines towards the base usually being shorter. Datura stramonium can be distinguished from this species in that Datura stramonium has a capsule with 100 more or less equal slender spines, the flower being up to 10cm long. Datura stramonium and Datura ferox have their capsules erect on straight stalks with the seeds being black or grey. Datura leichhardtii, Datura metel, Datura inoxia and Datura wrightii can be differentiated from these two species as their capsules are held on a curved stalk, with the seeds being brown or yellow. All parts of the plant are toxic to livestock and humans. It is malodorous (evil-smelling) and has a bitter taste. Usually this deters consumption by livestock.